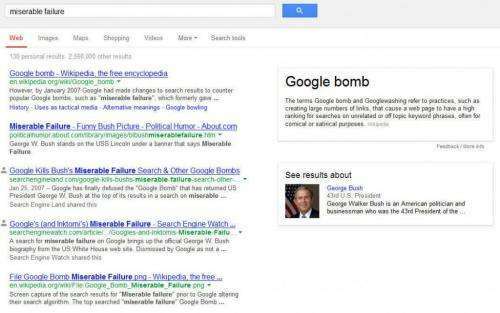 I’ve written about Google Bombs in the past, and how a bio page featuring President George Bush ranked highly on a search for “Miserable Failure” as a result of a Google Bomb, in a post from 2011 titled How a Search Engine Might Fight Googlebombing. In a post from earlier today, Nemek Nowaczyk wrote a post Google Bombing the Knowledge Graph: Whoâ€™s a Liar? He noticed that on a search for “liar” (in Polish), Polandâ€™s Prime Minister Donald Tusk appears in the knowledge base results for the search. Nemek sent me an email with a link to his post. Within seconds, I was typing one of the better known English language Google bomb phrases into a Google search, with a guess as to what I would see there. Ok, so the top knowledge base result on a search for “miserable failure” wasn’t George Bush. But a smiling George Bush was close enough to be a “see results about” disambiguation knowledge panel result. Google probably didn’t intend the Polish Prime Minister to show up on a search in Polish for “liar,” or George Bush in an English language search for “miserable failure.” But it’s easy to understand how Google Bombs might have slipped into Knowledge Base results for the two. For more about Google knowledge panels, see my recent post on How Google Decides What to Know in Knowledge Graph Results. I couldn’t help but chuckle at this. To have this former president and the words “knowledge base” in the same sentence. The Universe works in mysterious ways, and apparently so does the online universe (said tongue-in-cheek). Thanks, I needed that. That’s a really good questio – where does that fine line exist between a page that ranks well and might be seen as an “authority” or a “navigational” result for a certain query, or even an entity that might be associated with a specific site, and anchor text that might be seen as a Google Bomb or contains a high level of repetition of anchor text in a way that might be something a site might be penalized for? Chances are that having a wide range of links from a diversity of relevant pages can be seen as a positive signal. If some of those pages are pages that might also rank for that anchor text, that could help, too. It probably also helps if many of those pages and links are seen as higher quality pages instead of pages that might appear to have been created only to help improve the PageRank and/or hypertext relevance of pages being linked to – that can make the pages being linked to appear to be given editorially judged quality pages instead of doorway pages, for instance. Anchor text pointed to pages that not only uses specific (exact match) anchor text, but also anchor text that might be related to each other based upon things like co-occurrence as described in places like Google’s Phrase Based indexing patents also can likely be seen as a positive signal regarding how anchor text pointed to pages might be perceived by search engines. Ha ha very funny. I remember when it originally happened and it was funny back then but now, with Google (supposedly) being a lot cleverer and constantly wanting to improve their algorithm. Very poor showing in my eyes.